Full of aromatic, peppery, authentic Thai flavors, these Spicy Thai Chicken Kebabs with Black Pepper and Thai Basil Chicken are perfect for a backyard summer BBQ, and even more so, when paired with a cold Heineken! Have I told you guys before about this very Sri Lankan tradition of pairing spicy “bites” (spicy party appetizers) with beer and booze at parties and gatherings? Typically it’s a bowl of spicy, mixed nuts or deep-fried meat or cocktail sausages or these fish cutlets. Occasionally, that spread would become more varied depending on the host’s hospitality. 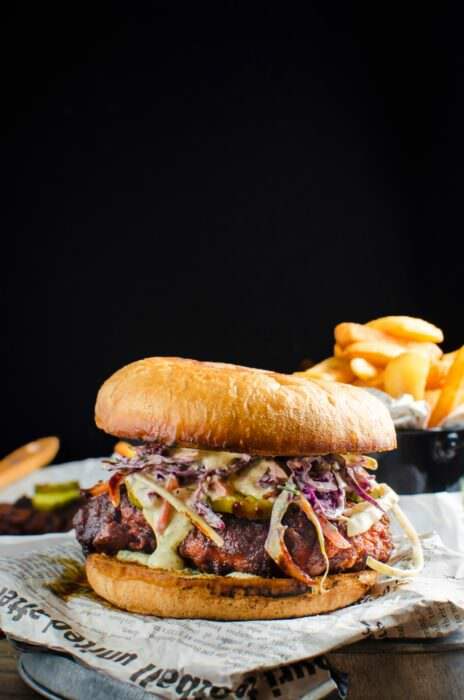 But they were always spicy bites – sizzling with spicy heat and intense flavor – and just the best darn accompaniment to a chilled beer, in the whole wide world! As kids, I remember how envious we were of the adults, seeing them snacking on those spicy bites, which for reasons that I still don’t get, weren’t offered to those who weren’t involved in their booze-filled, merry-making. Why should they get their own appetizers? 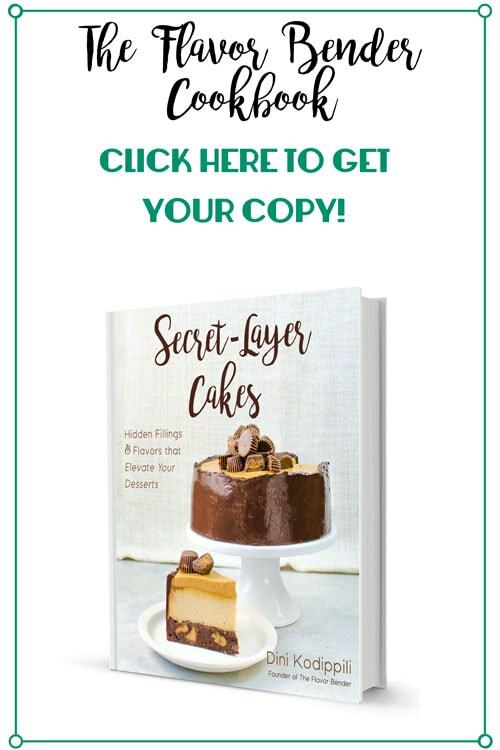 So we always hung around them, zooming in and out of their space, grabbing whatever we can from their plates, in fistfuls of spicy deliciousness that were better than anything else served up at the party anyway. Fast forward twenty years and half a dozen moves across towns, countries and continents, things are still the same for me. A cold beer just isn’t the same without something delightfully spicy. 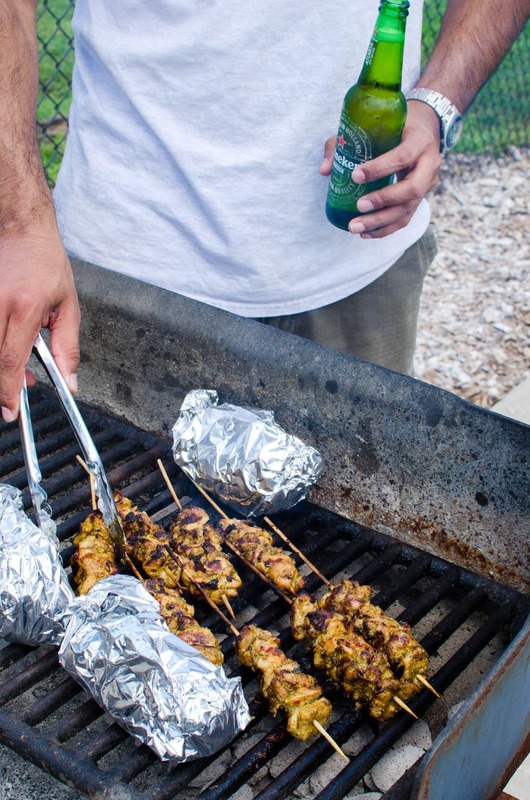 So I channeled that Sri Lankan spirit and celebrated summer with a backyard BBQ for two with delicious Spicy Thai Chicken Kebabs and a cold Heineken! The bitterness of the hops was a good balance for the spiciness in these spicy Thai chicken kebabs. That first sip of cold Heineken enhanced the heat and the flavors, since the bitterness and carbonation complement the heat. Since Heineken is made simply of barley, hops and water, it has a clean taste and a great quality. While I do love cooking with chicken breast, for BBQs I prefer to go with the dark meat of chicken thighs. 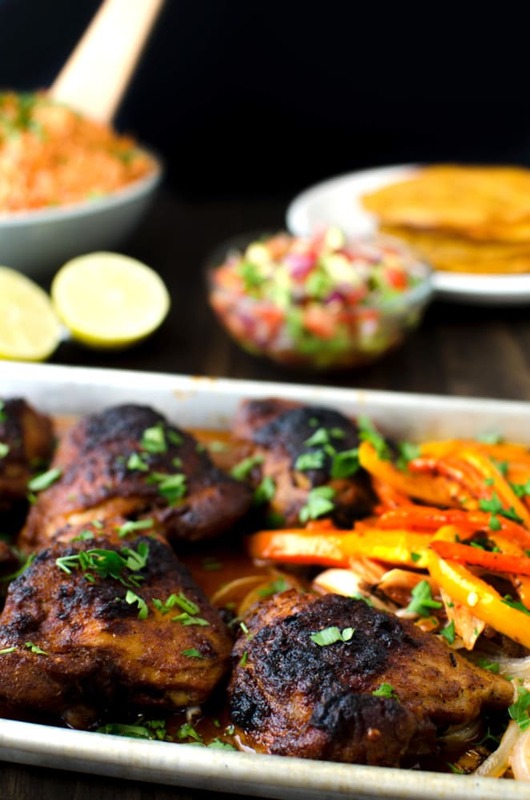 That way the heat of the BBQ doesn’t dry out the chicken, and for a fun, carefree day around the grill, you don’t have to worry about overcooking the chicken when you use boneless chicken thighs (marinated with some intense Thai flavors!). Black pepper and Thai basil chicken also happens to be one of my absolute favorite Thai stir-fries. It used to be my go-to stir fry every time I had lunch at this little hole-in-the-wall Thai restaurant across the street from my office, back in Lismore, Australia. And it continues to be one of my favorite flavor combinations to this day! There’s a lot of rich, aromatic, peppery and authentic Thai flavors in this black pepper and Thai basil chicken. 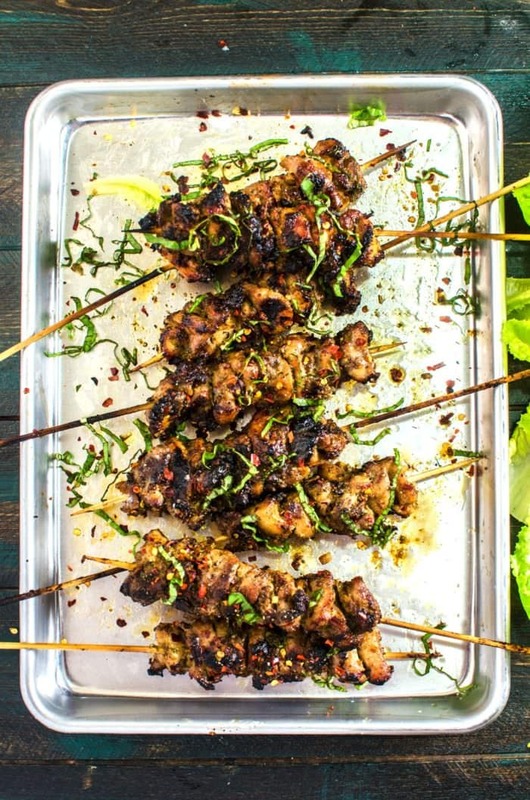 One taste of these spicy Thai chicken kebabs and you’ll see what I mean! 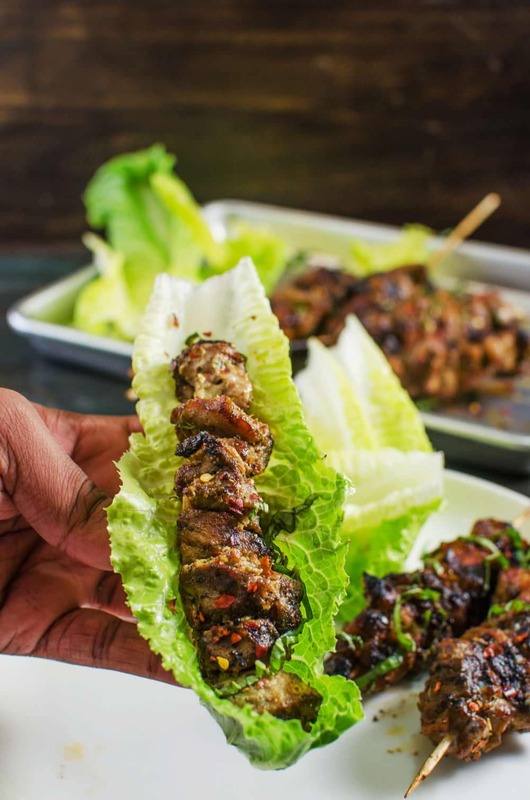 If you don’t have access to a grill, no worries, you can just as easily make these spicy Thai chicken kebabs in the oven, or on a pan. The only flavor addition you’ll miss is that characteristic smoky BBQ flavor, but even without that, this Thai spice mix produces some incredible flavors in this spicy Thai basil chicken. I swear we were hungry as soon as the chicken hit the hot grill, because that aroma was simply eye-watering. 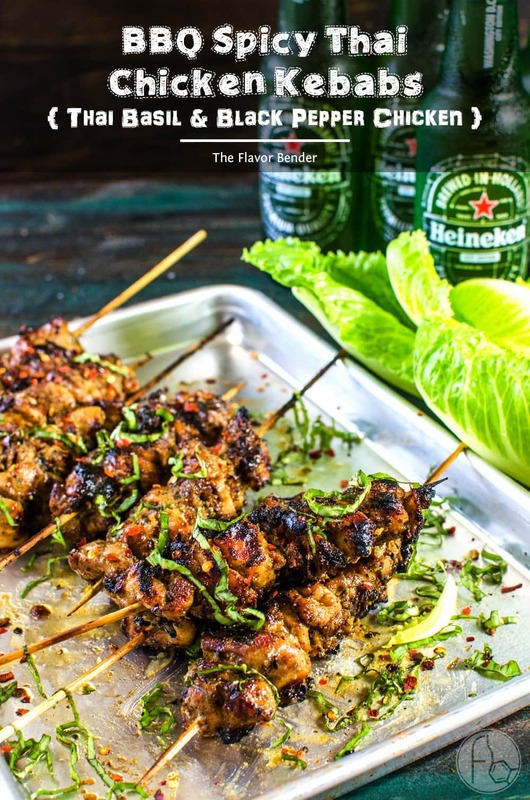 A chilled Heineken in one hand did make things a little easier till our lunch was ready, but together, these spicy Thai chicken kebabs in lettuce and a cold Heineken make for a dynamite combo! 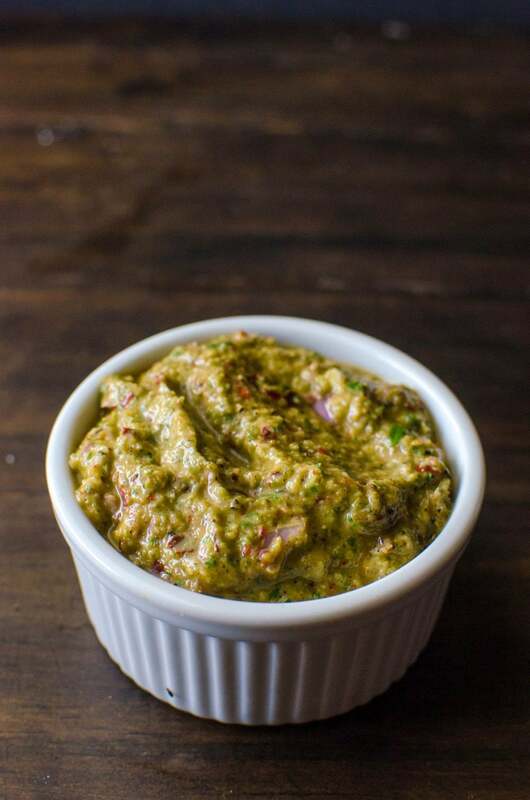 Place all the ingredients in a small food processor and pulse until you have a smooth paste. Set aside. Mix the chicken and spice mix together, and set aside for at least a few hours to marinate, preferably overnight. Also, place the wooden skewers in water, to soak overnight as well. 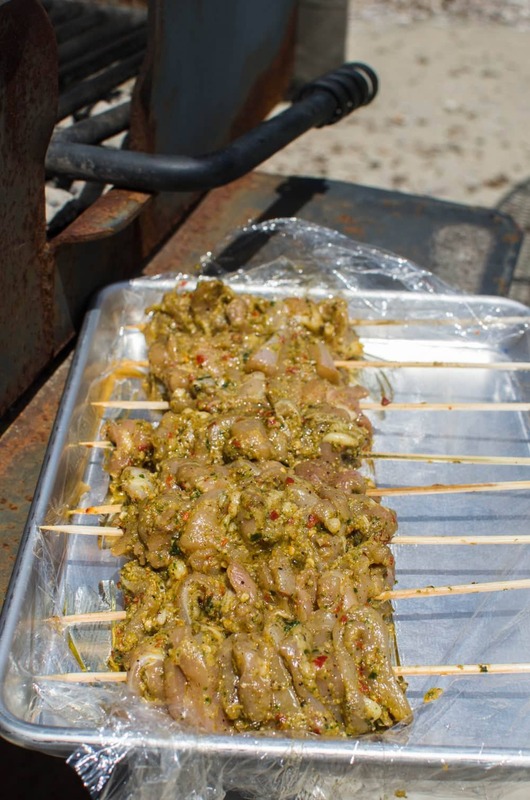 The next day, skewer the chicken, dividing it up between 8 - 10 skewers. Prepare the grill to a medium high heat, and brush the grill with some oil. Place the chicken skewers on the grill, and cook them about 5 - 10 minutes per side until the chicken has nice grill marks. 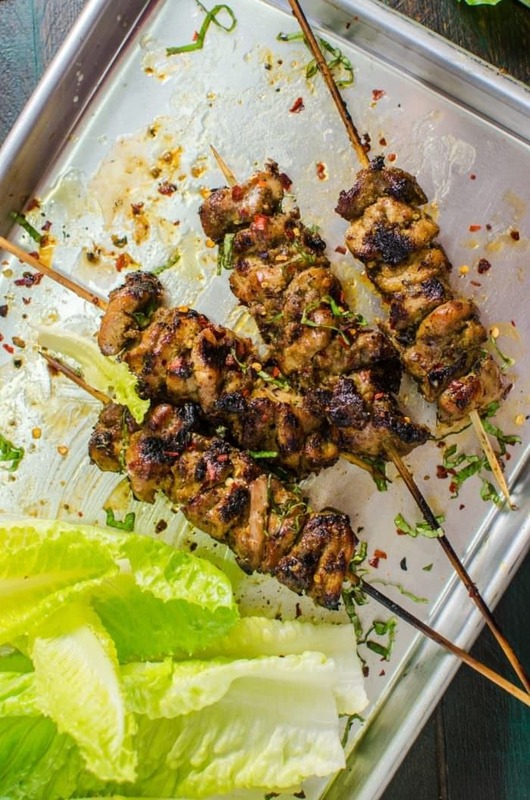 Cook the chicken kebabs on all sides. Sprinkle black pepper and chopped basil on top before serving. 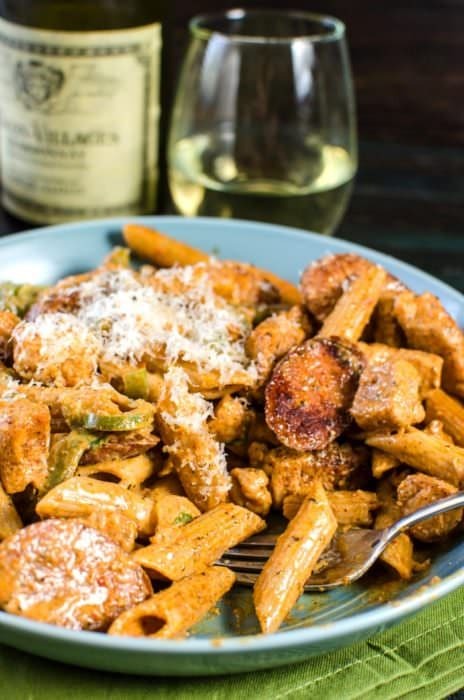 Serve with Romaine lettuce (optional). 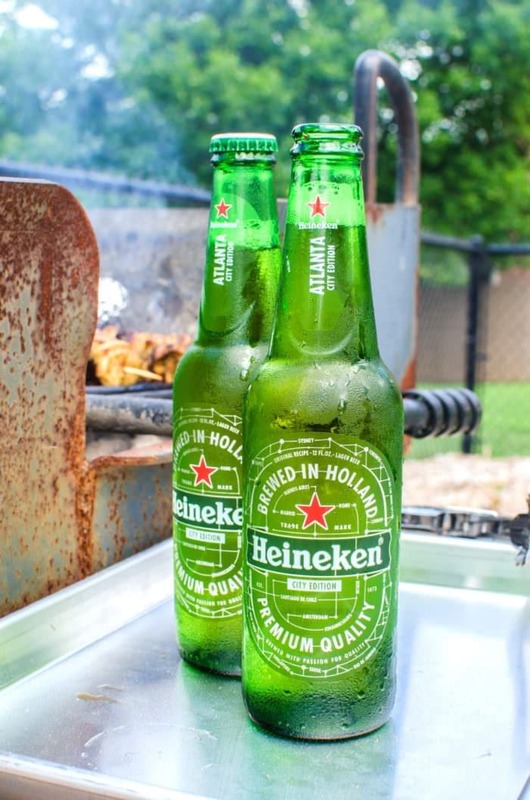 Make your Summer special by sharing Heineken with friends and family! Find out where you can get Heineken near you – and make sure you check the fridges for the 12 pack you’ll be taking home! 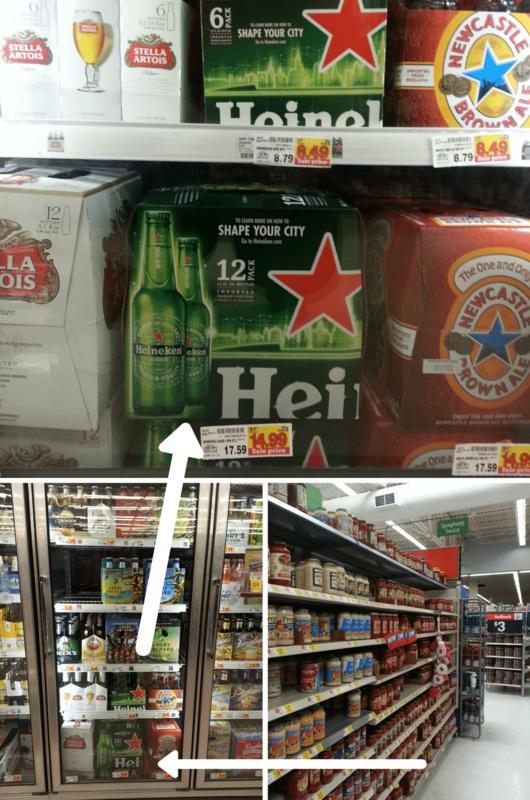 What’s your favorite pairing with a Heineken? 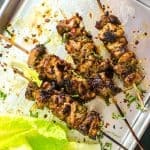 If you liked this Spicy Thai Chicken Kebabs recipe with Black Pepper and Thai Basil Chicken, don’t forget to subscribe for new (and free) recipes by entering your email address on the side bar (and get all these recipes delivered straight to your inbox), so you don’t miss out on a thing. You can find me on FACEBOOK, TWITTER,INSTAGRAM, PINTEREST, YOU TUBE and GOOGLE-PLUS too. That’s incredible Joseph! I am so glad they were such a hit! Where was my invitation to the party?? 😉 hahaha! Thank you so much for taking the time to let me know too! These look amazing, can’t wait to try! These look amazing! We served Heineken @ our wedding! Thanks for making me drool!